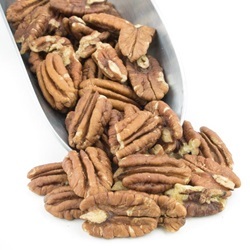 Pecans are the most popular nut in the United States. Organic, shelled, raw, and delicious, they can be eaten plain, roasted, or added into your favorite recipe. To roast them at home, spread raw nuts on a baking sheet and bake at 350 degrees for 5-10 minutes.